Today’s bathrooms are the space offering homeowners the best opportunity to combine design with functionality. 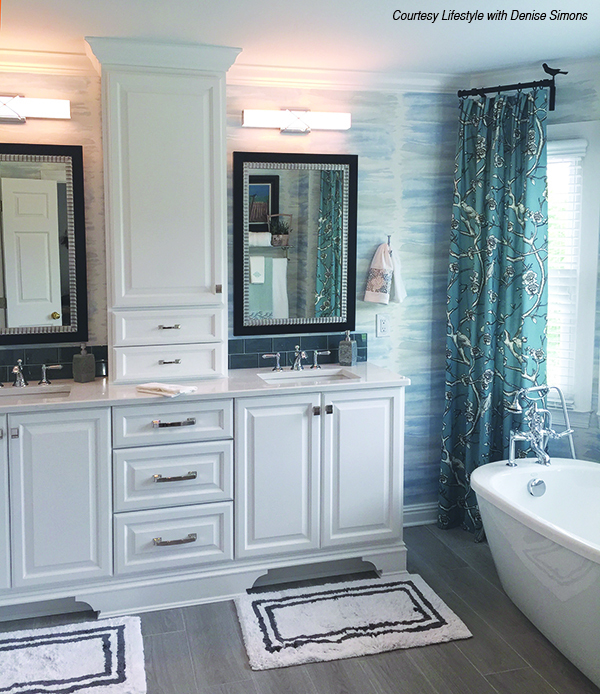 Large spa-like master baths with large multi-head walk-in showers and double vanities continue to be popular, while powder rooms allow home decorators to flex their design muscles. 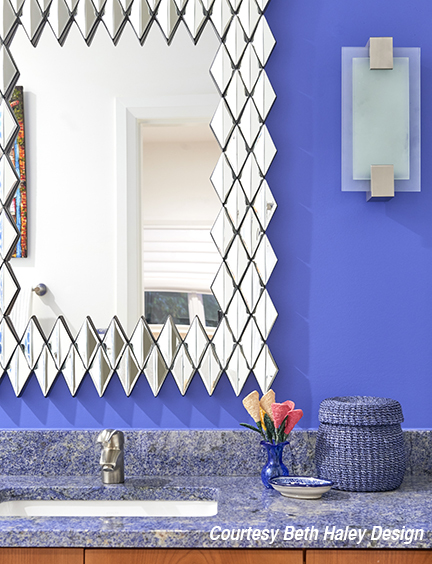 According to Allison O’Keefe of Cambria, “bathrooms have been spa-inspired—sprawling and luxurious—for several years, and that trend is not changing.” Color is also key, and tile in specialty designs creates a designer look with unique and functional finishes. 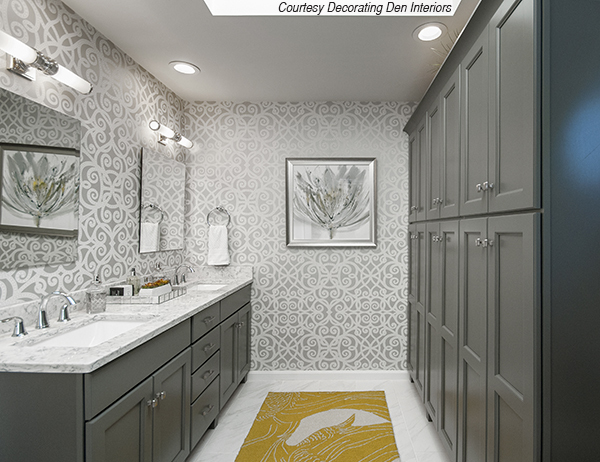 One trend for many large master baths isinclusion of a large shower in preference to a bathtub, according to Bohnne Jones of Decorating Den Interiors. “As long as they have one tub in the house, clients feel safe doing so, now more than ever,” she says. Despite many homeowners’ preference for a large walk-in shower,free-standing tubs remain popular as well, especially in the largest master suites. 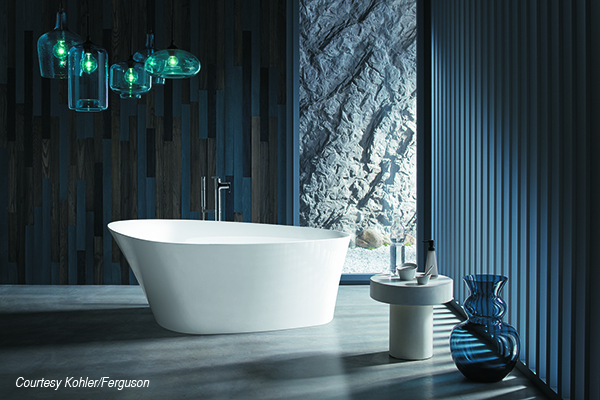 Whether new construction or a remodel project, many homeowners are selecting items for the bathroom that incorporate modern shapes and forms, according to Stansell Dye of Ferguson. “Modern shapes and forms for bathroom faucets are now daring, yet their clean, curved lines and soft edges make them easy to incorporate into any design style,” he says. Clawfoot tubs and tubs with pedestal bases are out, Dye says. 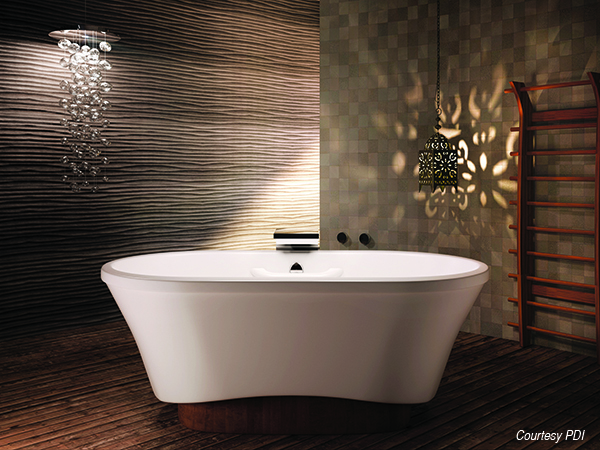 “Today’s freestanding tubs have clean lines, sleek geometric shapes, and take center stage as the focal point of any spa sanctuary. The National Kitchen and Bath Association reports it sees fewer whirlpool baths in favor of decorative, free-standing baths. NKBA also notes that larger showers require special features such as a bench and multiple shower heads, including a handheld shower head. Jones adds that radiant floors are also a popular feature in large master baths as homeowners don’t have to heat the rest of the house to stay warm while getting ready for work on a cold morning. 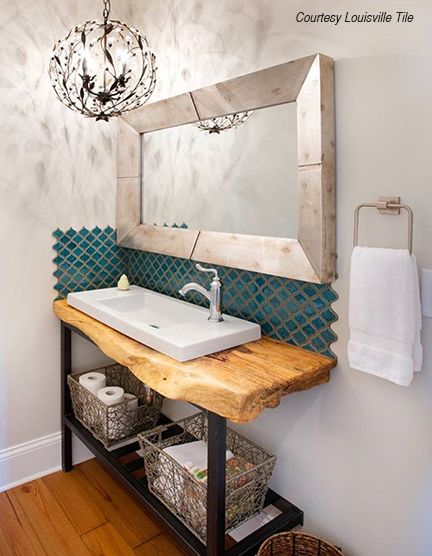 As far as storage, above-counter storage is a key component in bathroom design. Otherwise known as medicine cabinets, above counter storage denotes homeowners’ desire to include such things as lighting, electrical outlets, cold storage, and magnifying mirrors in their bathroom design. Today’s vanities are aboutunity of form and function, according to Dye. Intuitive yet innovative, thoughtful design seamlessly pairs with practical functionality. “Bathroom vanities are also all about personalization. They can be customized with your choice of finish, configuration, adaptable accessories, and bold color options,” he adds. Mary Soeder of PDI points out, “We have many clients who are opting for what we call above-counter storage in large and small bathrooms. These storage solutions are not your grandmother’s 1950’s wooden cabinet box.” New types of bathroom storage keep everything easily accessible and the integrated lighting can be perfect for small spaces, combining storage and lighting in one unit. Choice of finishes seem to be a driving factor in design as well. 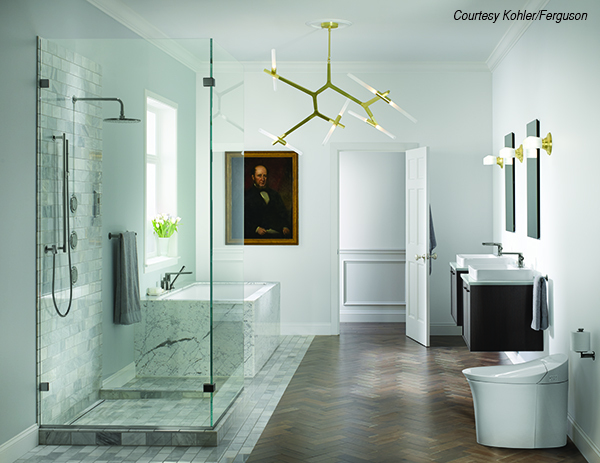 “Most of our clients are selecting items based on finish,” Soeder continues, pointing to brands such as Kohler, Delta, Rohl, and Moen, which have many finishes available for the large lines of products. As important asfinish is functionality, Soeder says. “If it looks good but doesn’t function, especially in the bathroom, clients are less likely to embrace the new look.” She also notes that aesthetics have as much to do with the choice of finish as saving water. Although designing a large bathroom might make adding unique features, bold colors, or specialty wallpaper scary or cost prohibitive, powder rooms still offer the best place in the house to experiment and use specialty finishes, wild wallpaper, or incorporate an expensive sink. “Powder rooms are a great place to splurge because they are smaller and you only have to buy a few things to really make a statement instead of all the components of a master bath,” Soeder says. Texture is a way for homeowners to explore options they might not otherwise consider. 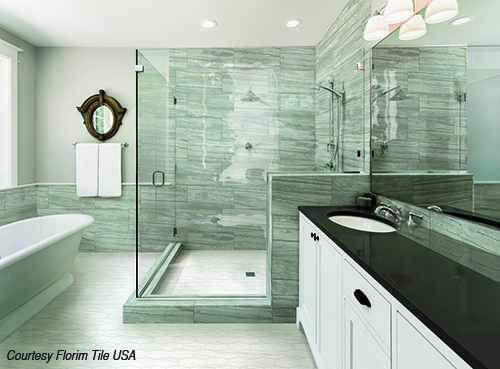 Tile is the number one way to explore both texture and color in a bathroom, according to the experts. Fish scale tile tops the list as one of the hot trends in tile and many textured tile allow the creation of specialty designs that echo the appearance of wallpaper. Round shapes are also popular, and homeowners are gravitating toward penny and hexagon shaped tiles. Still quite popular are tiles designed to resemble natural stone or wood planks. “Tile is always a great way to express personality. Tile is great because you have a lot of variety in shape and size whichallow for broader choice and personalization,”says Kate Gray Fudim of Beth Haley Design. Whether a bathroom is large or small, homeownerswant functional and fabulous spaces that express their design personality. Ultimately, homeowners want to make a statement in the bathroom while preserving the functionality of the space. No matter the size, style, or décor, the combination of aesthetics and functionality remain importance in bathroom design.